Welcome to Three Fires Tipi Night Lights! Our authentic, native-made tipi night lights are created in our home on the Walpole Island First Nation Reserve in Ontario, Canada to suit your home. 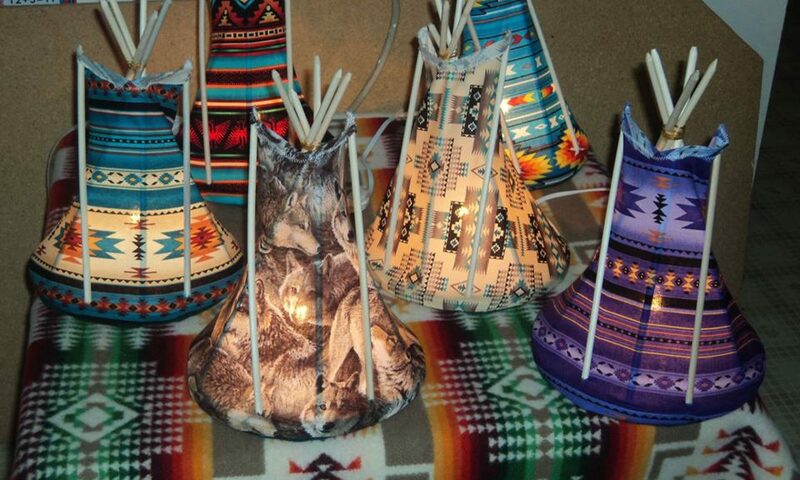 Tipi night lights are available in a wide assortment of designs and patterns including hand painted designs, fabric transfers, licensed sports teams, and memorials for a loved one on white sateen material. Please see the Pricing page for more information. We ship our tipi night lights worldwide. Here are some examples of our tipi night lights. Please note that fabric patterns are subject to availability and some patterns may be retired. Tipi night light dimensions are 12 inches high X 8 inches round. Tipi night lights can be purchased in person at Iroqrafts in Ohsweken, Ontario. They can also be bought at powwows (see the Powwow Schedule page. Here is a list of powwows we have attended in the past: Caldwell, Pine Creek, Pokagon, Michigan State University, Harbor Springs, Mt. Pleasant, Six Nations, Algonac, Brighton, Windsor, London, Conestoga College, Sarnia, and of course Walpole Island. Tipi night lights can also be ordered through our Contact page. Check out these beautiful special order tipi night lights from the 2017 Potawatomi Gathering! We also offer tipi night light workshops for schools, colleges, organizations, and community groups. Please see the Workshops page for more information. We have a Master Business License with the province of Ontario in Canada (Registration # 240399394).